There's so much to see and do in Highland Perthshire that we're struggling with where to start! If you just want to relax in stunning surroundings, visit somewhere interesting or take a riverside walk, have a nice lunch or evening meal, or perhaps take in a show or concert, Highland Perthshire won't disappoint. Or do you want to get outdoors, experience our amazing natural environment to the full, walk or ride our amazing network of paths? It's all here for you, with plenty of fantastic places to be entertained or tell your tales in the evening. And if you're looking for something to get the adrenalin going, Highland Perthshire is one of the greatest places on earth to experience white water rafting, canyoning, mountain biking, bungee jumping or any number of other adventures. 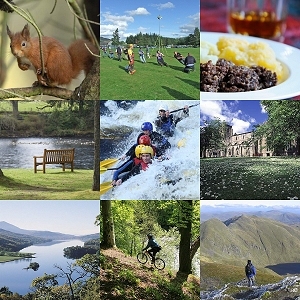 The choice is yours, and Highland Perthshire is what you make of it... it's all here!